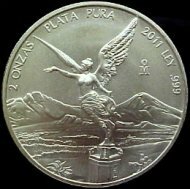 In 1987, following the successful release of the 1oz. and the fractional sized Australian Gold Nugget bullion coins, in 1991, the Perth Mint added three more gold coins to the series, the 2oz., 10oz., and the 1 Kilogram gold bulion coins . In 2009, the Perth Mint stopped producing the 2oz. and 10oz. gold nugget / kangaroo, however, it still mints 1-kilo gold bullion coin. The obverse side displays the profile of Queen Elizabeth II designed by Ian Rank-Broadley. His initials "IRB" are inscribed directly below the Queen's neck. "ELIZABETH II" is inscribed around the outer perimeter of the coin. 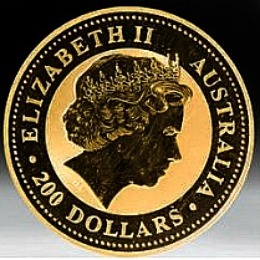 The face value of "200 DOLLARS" and "AUSTRALIA" are also inscribed along the inside of the outer perimeter of the gold bullion coin. 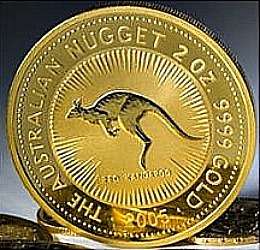 The words "THE AUSTRALIAN NUGGET" are displayed across the top of the coin. The gold bullion coins weight of "2 OZ" and purity of "9999 GOLD" are inscribed around the perimeter of the coin. The Year of Issue is also displayed on this side of the Australian Gold Nugget bullion coin. Note: The first year the 2 oz. 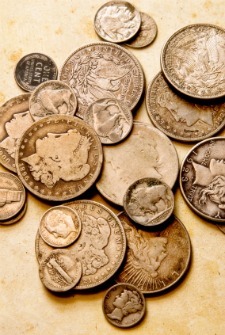 bullion coin was minted it had the face value of "500 DOLLARS." Starting in 1992 and continuing to the present day, the gold bullion coin has had the face value of "200 DOLLARS."